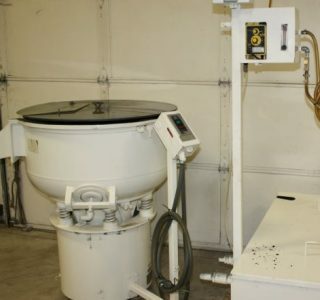 A vibratory finishing machine (also known as a vibratory tub or vibratory bowl) is a type of secondary process that cleans, deburrs, polishes, dries, or otherwise finishes a previously cut part. It differs from a vibratory tumbler in that the abrasive action happens due to the media added to the tub rather than due to the pieces rubbing against one another. It also differs from a barrel finishing machine in that rather than a rotating horizontal barrel turning the parts like a bingo ball, the whole tub pulses at once, cutting the whole load simultaneously. 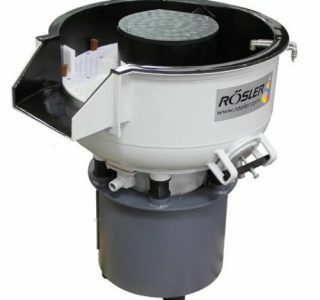 Vibratory finishers are much faster than barrel finishers (though slower than centrifugal disc finishers) and can be operated on a stand-alone basis with no need for extra equipment. 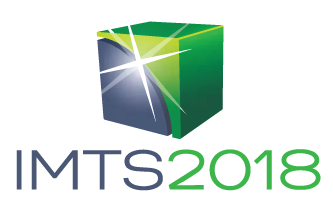 They are quieter than tumblers and can finish inside diameter surfaces that could not be reached by tumbler-style finishers. Because there is no tearing action or unequal application of force--because the whole machine moves as a unit--a vibratory finishing machine can handle any sort of part, from rough-cast steel to chinaware. 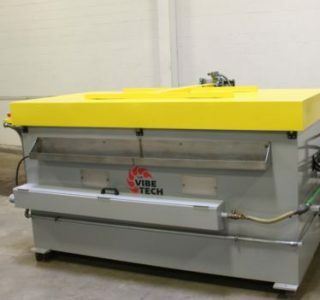 For answers to your questions or more information on vibratory finishing machines call Liberty at 847-276-2761 or send us an email sales@libertymachinery.com. 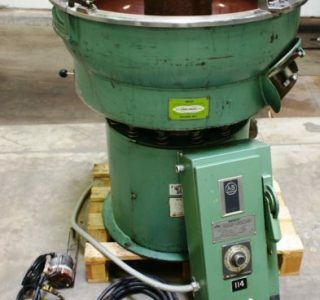 Liberty Machinery buys and sells all types of vibratory finishing machines. 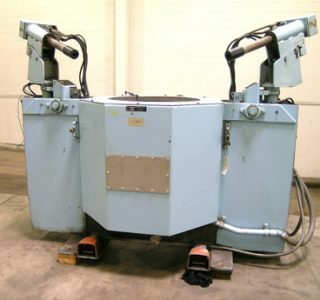 We are your trusted source for high quality used finishing and polishing machines. 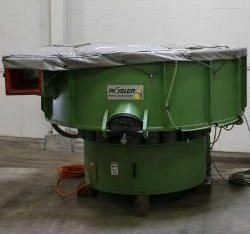 A vibratory finisher can be broken down into three parts: the tub, the revolving weights, and the screen. Alongside this basic setup the operator must add the parts, the abrasive media, water, and a chemical compound solution. Depending on the type of part being finished, the operator will select a certain sort of preformed plastic or ceramic "stones," pouring perhaps 100 or more pounds of the media into the tub along with the parts. Water is added to maintain lubrication and various types of chemical compounds are mixed in to clean metal parts and prevent corrosion. A vibratory tub may have several formed spirals inside it around which the parts will travel. The shaking produced by the weights revolving eccentrically underneath the tub causes the contents of the tub to creep forward as they are finished until they reach the screen, which filters out the liquid and the media while transferring the finished parts out of the machine. Deburring of automotive engine castings and fuel pump bodies, electrical components, ball point penclips, tire needle valves, etc. Surface improvement of china plates, cups, and teapots, stainless flatware, golf irons, surgical equipment, etc. Preplating of wrenches, luggage hardware, jewelry, eyeglass frames, etc. 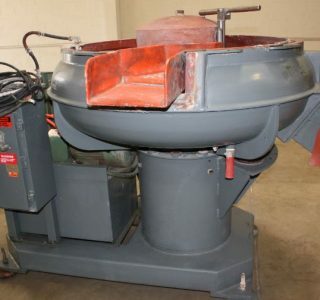 Liberty is always looking for used vibratory finishing machines to buy for inventory. Contact us and let us know what you have for sale. We’ll be happy to give you a free quote. 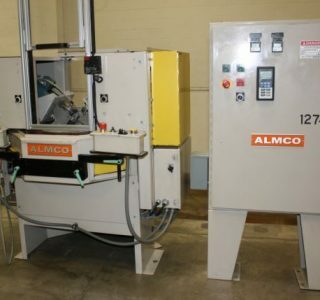 See our used Vibratory Finishing Machines for sale. Kramer Industries, "Choosing the Right System." Retrieved from http://www.kramerindustriesonline.com/finishing-guides/choosing-the-right-system.htm. Roto-Finish Corp., "Roto-Finish Media Spiration," (Kalamazoo: Roto-Finish Corp., n.d.). Roto-Finish Corp., "Form ST379," (Kalamazoo: Roto-Finish Corp., n.d.).